Here is my favourite photo of two precious family members who were my earliest mentors in the profession of Nursing. I happen to be named after one of them. Violet Lucak Melenchuk, my mother, completed her Nursing diploma in 1949 at Portland Sanitarium and Hospital. She was one of the first student nurses to be “allowed” to marry in 1948, a year before she graduated, because her husband, John Melenchuk, was beginning Optometry School at Northeastern Illinois University in Chicago in September 1948. They kept in touch through letters during their first year of marriage and only saw each other at Christmas. When my mother graduated from Portland Sanitarium and Hospital in the spring of 1949, she moved to Chicago to be with my father and worked for several years at La Rabida Children’s Hospital, Chicago while my father finished his Optometry degree. My Mother’s sister, Janice Luchak Hale, who is shown in the first photo with my mother, also studied nursing at Portland Sanitarium and Hospital and graduated a year or two before my mother. She married Jack Hale who was accepted to the School of Optometry at Northeastern Illinois University in Chicago and who influenced by father to study there as well. Following my mother’s graduation from nursing school, these two newly married couples spent their early years of marriage working and going to school in Chicago. There is a serendipitous synchrony to this story. When I was born, I was named after my Aunty Janice and my own nursing career has followed in her footsteps. Following her divorce from Jack, Aunty Janice began working on her Bachelor’s and Master’s degrees in Nursing and served as a faculty member at the School of Nursing, Walla Walla College campus in Portland for many years. I chose Walla Walla College (now named Walla Walla University) to do my undergraduate nursing degree. In the early 1970’s, I too lived and went to classes in the same Nurses Residence (located across the street from what was the original site of Portland Adventist Hospital shown in the photo of my mother above. My Aunty Janice was one my teachers during my senior year of undergraduate nursing education at Walla Walla College, Portland campus. However, she was, first and foremost, my special Aunt and I was proud to be her namesake. She generously included me in her family and nurtured me with many home-cooked meals and picnics and hikes on weekends at Multnomah Falls and surrounding area. My nursing career was even fashioned after hers. Following my undergraduate degree in Nursing from Walla Walla College, I went to Loma Linda University to complete a Master’s degree in Mental Health Nursing and was fortunate, at age 23, to be hired by the University of Calgary where I served as a member of the Faculty of Nursing for 33 years (and, along the way, and completed a PhD in Counselling Psychology). Coincidentally, but perhaps not, my area of nursing scholarship is focused on advancing knowledge in Family Nursing which recognizes the powerful reciprocal influence that families have in health and illness and healing. 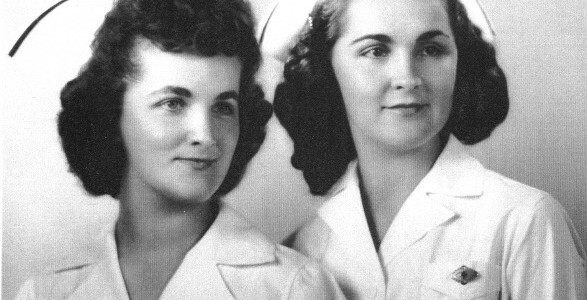 I am standing on the shoulders of giants—my precious mother and aunt were my earliest role models in Nursing. And the circle of influence and serendipity continues with my daughter, Ashley, whose birthday is coincidentally on May 12—International Nurses Day! Ashley earned her undergraduate nursing degree from Loma Linda University in 2011 and is enjoying a successful career as an critical care nurse in Loma Linda, Portland, and Denver. “Nurses: With You Every Step of the Way”, is the motto of this year’s Canadian Nurses Association celebration of International Nursing Week. My family history has embodied this sentiment across three generations.